Tom I recently saw what looked like a semi-hidden dovetail cut into 45 degree mitre edges. Any idea how that is done, other than just chiseling out the sloping joints between tails and pins? I suspect it is not as strong as this joint you have shown? I have read FWW articles on the mitered dovetails. [There are not doubt some YouTube examples of varied quality on the subject as well.] I believe I did one test joint long ago. And probably used it for a small box project, but don’t recall which one. If I looked at my box collection mitered joints without splines would be the evidence. From first impression I would think the strength of the joint would depend on material thick enough to have adequate support. The prime consideration is the look you are going for and your skills. Traditional half-bind leaves visible end-grain rather than a tight mitered corner. In casework that is commonly covered by a top or drawer front from one view, end grain shows from the other. Many people use full dovetails and cover it with molding on casework. I do not typically use molding in my designs. 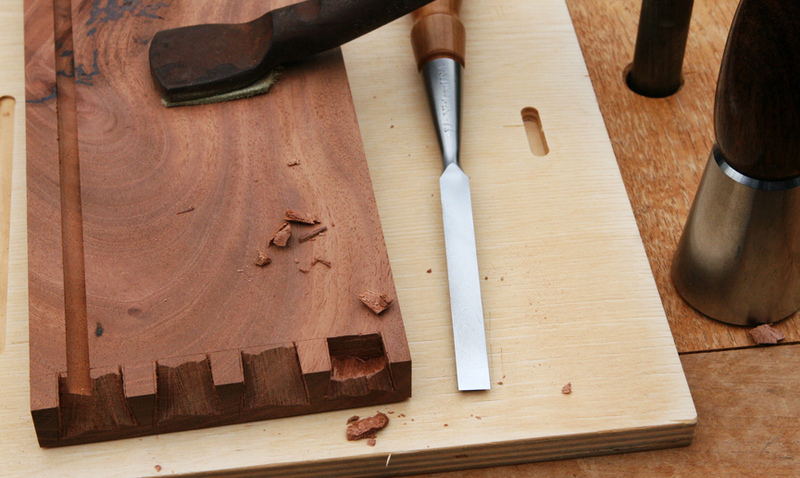 The beveled dovetail may not be as strong, but should be strong enough. That strength may be more dependent on quality of the fit. With half- and full-dovetails the joint can be pretty sloppy and still give adequate strength.